At the end of the summer, 12-year-old Colin was climbing around in Rock City, a popular area at Mt. Diablo State Park. Since the temperature was in the high 80’s, he was wearing only shorts and tennis shoes as he scampered from rock to rock in the bright sunshine. Unfortunately, he suddenly lost his balance. A large bush broke his fall, but he ended up scratched and bleeding where the branches penetrated his skin. The next day in the hospital emergency room, Colin learned the bush was poison oak, and he had several painful days of recuperation ahead of him. 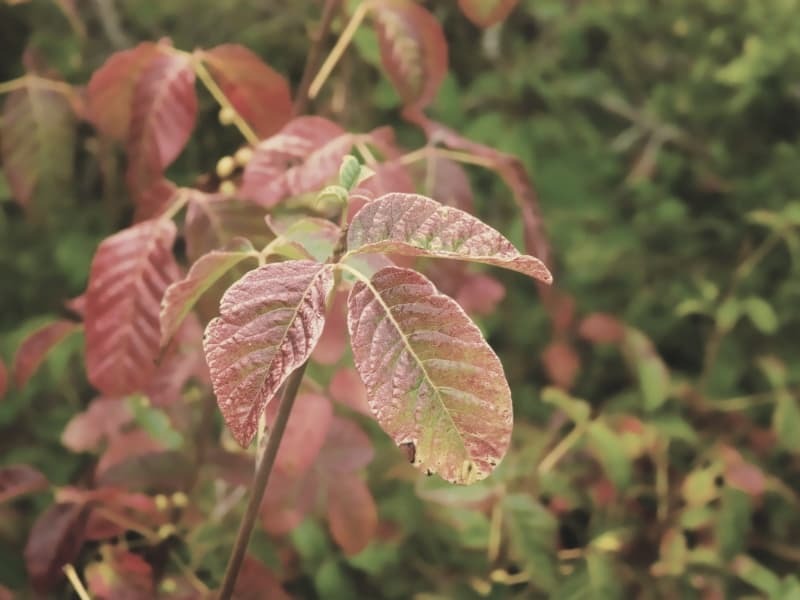 Poison Oak is part of the outdoor experience – but a very unpleasant part for many backpackers. Most people (about 80%) have an allergic reaction to the urushiol oil that is easily transferred from poison oak to the skin of hikers, backpackers, and campers. This oil is plentiful in the leaves, stems, and roots – even when the plant is dead. Fumes from burning poison oak can be toxic, even life-threatening. Unfortunately, poison oak is extremely common in Northern California. Redness and sharp itching (you might wake up in the middle of the night scratching). A rash erupts where the oils have come into contact with your skin. The rash develops into red bumps, called papules, which itch unbearably. Oozing blisters develop that soak your clothes, sheets, furniture, and everything else with fluid. Itching is less intense but still significant. The blisters dry up and the poison oak rash disappears after about a week of torture. If you are not careful, you will re-contaminate yourself by getting more urushiol on your skin when touching your backpack or the clothes you wore when you got into the poison oak in the first place. You can also get a poison oak reaction from dogs, garden tools, and sports equipment that have been in poison oak. Only exposure to urushiol oil causes the rash. It is not spread by scratching or the liquid in the blisters. The thickness of your skin in the affected area determines how quickly the rash develops, so it might appear that the rash is spreading just because it is developing at different speeds on different parts of your body. If you are exposed to poison oak on an outing, deal with it as soon as possible – before the allergic reaction is noticeable. Wash your skin (especially your hands) immediately with Tecnu, Zanfel, or a similar medical soap. Use more Tecnu than you think you need and wash for longer than you think is necessary. These soaps can be purchased in most drug stores and are specifically formulated to disperse urushiol. They should be in every medical kit. (According to some experts, regular soap may actually spread the oil.) Always wash in tepid water because hot water opens the pores and facilitates the absorption of the oil, which can increase the allergic reaction. Don’t take a hot bath when you get home or you might regret it a lot. 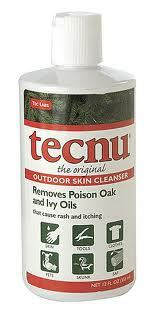 Tecnu and similar products are effective with poison oak rashes. After the poison oak rash develops, people deal with the intolerable itching in a number of ways. Many years ago, older Scouts told me to rub the impacted area with a rough washcloth until it bled (which felt really good) and then pour bleach over it (which felt really bad). The idea was that it’s easier to withstand pain than intolerable itching. Today, there are better ways to deal with poison oak. Poison Oak anti-itch products from suppliers like Tecnu or Ivy-Dry can be sprayed onto the rash to reduce itching and promote healing. Continued washing with their soaps is also useful, even after the oozing begins. Many poison oak sufferers say that calamine is not effective. Hold the affected area under hot running water. Go to the faucet (or shower) and soak the infected area in hot (almost unbearable) running water for a couple of minutes. The area will itch intensely at first, but eventually, the rash area will numb and you can turn off the water. For some people, this provides relief for an hour or more. Get a shot of prednisone. If your poison oak is very bad, go to the doctor and discuss Prednisone, a type of steroid. There are risks to taking steroids, but with poison oak sometimes the benefits are greater than the risks. Other popular remedies include rubbing alcohol, pastes of vinegar and baking soda (get in the shower and scrub your rash with the paste), rubbing the area with crushed Jewelweed or Mugwort, and/or soaking the rash in urine (might be difficult to explain to parents). Antihistamines like Claritin and Benadryl can also reduce the symptoms for some people. Despite the fears of many, most cases of poison oak are manageable, even if they are extremely unpleasant for a few days. (Once, I saw a boy get hysterical and almost throw himself off a cliff when he realized that he was in a poison oak forest near the top of a waterfall. He did break out in a rash but survived.) If you worry about it, hike in the mountains. Poison Oak does not grow above 5,000 feet elevation. Fear of large spaces or any other phobia can impact your enjoyment of the outdoors. Learn how to move through these fears. How to survive in the wild. Check out our bear safety tips to keep you (and the bears) safe. Sadly not everyone is up on LNT principles. Learn how to dispose of human refuse correctly. A backpackers bane – learn how to keep away mosquitoes. Not just annoying, but dangerous – learn how to avoid tick bites. Swimming pools are a great place to wash away poison oak. The chlorine and the cool water seems to get rid of most of it. So find a Scout with a swimming pool and then stop for a quick swim on the way home. They can always wash with Tecnu when they get home for extra protection. Unfortunately, I am a carrier. Not sensitive myself, I contaminate those around me. Just ask my son Chris. When “Mike” was a lad, he and his scout troop went out into the boonies on a trip. They went up a mountain. They crawled down right through the bushes and brush, 90% of which were poison oak. When Mike got home, he took a nice hot bath. All the poison oak oil rose to the surface, and when he got up it coated him. As a result, he got poison oak on every inch of his body except the soles of the feet and the calloused parts of the hand. All his hair fell out, and he had to wear a bed sheet for the next six months while he recovered. WARNING! The activities described on 50miler.com carry a significant risk of personal injury or death. DO NOT participate in these activities unless you are an expert, have sought or obtained qualified professional instruction or guidance, are knowledgeable about the risks involved, and are willing to assume personal responsibility for all risks associated with these activities. 50MILER.COM MAKES NO WARRANTIES, EXPRESSED OR IMPLIED, OF ANY KIND REGARDING THE CONTENTS OF THIS WEBSITE, AND EXPRESSLY DISCLAIMS ANY WARRANTY REGARDING THE ACCURACY OR RELIABILITY OF INFORMATION CONTAINED HEREIN. 50miler.com further disclaims any responsibility for injuries or death incurred by any person engaging in these activities. Use the information contained in this website at your own risk, and do not depend on the information contained in this website for personal safety or for determining whether to attempt any activity described herein. 50 Miler is a participant in the Amazon Services LLC Associates Program, an affiliate advertising program designed to provide a means for us to earn fees by linking to Amazon.com and affiliated sites.